Like the popular Individual Retirement Account (IRA) has several IRA rules and regulations, the 401k retirement account is governed by certain 401k rules and regulations which investors must follow in order to get the most benefits from this account. For instance, the investor must know the prevailing 401k withdrawal rules in order to know what are the risks of having to pay penalties, and how much the penalties will be, if he makes an early withdrawal. There are times when the investors may need to take an early 401K withdrawal in times of financial difficulties, and these early withdrawals will be subjected to 10% penalties if the investor is under the age of 59 years and 6 months old. Some investors under the age of 59 years and 6 months old may still make some withdrawal out of a 401k account in the form of a loan. There are 401k loans rules that must be considered as well, and the maximum term for this loan is just 5 years, which means that the investor must pay back what he borrowed within 5 years or less. Furthermore, if the employee with a 40k account decides to resign from his job and leave his current employer, he may be forced to repay his 401k loan within a very short period. When the 401k account holder reaches the age of 59 and 1/2 years, he may take money out of his 401k account without having to pay the 10% penalty; but this withdrawal is still taxable. When the investor reaches the age of 70 and 1/2, he will be mandated to make a forced distribution from the 401k account at a required minimum amount every year. This amount of mandatory distribution is also taxed as a regular income. Certain considerations may allow the 401k account holder to take out money from his account out of emergency circumstances such as paying of medical bills that are not covered by medical insurance, disability of the account holder, the account holder is buying his first house, and paying of tuition fees. 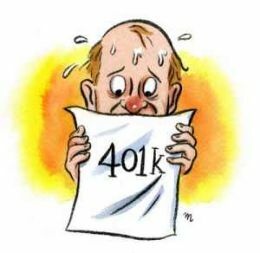 It is advised that the 401k account holder must talk to a financial expert in order to know if his situation qualifies for such 401k hardship rule. However, in case the employee with a 401k retirement fund left or lost his job, he may opt to make a 401k rollover to IRA. The 401k rollover is truly ideal because it allows the investor to transfer his existing retirement account into another retirement account, such as the IRA, without being subjected to unwanted and unnecessary taxes or withdrawal penalties. Of course, once rolled over to IRA, this account automatically becomes an IRA, thus it must follow certain IRA withdrawal rules as well. Just like the 401k, early withdrawal from IRA may also be subjected to taxes and penalties. If the 401k is rolled over to a Roth IRA, qualified withdrawals are not taxable any more. Roth IRA rules state that the investors must be at least 59 and 1/2 years old and that the account must have lapsed the 5-year holding period in order to qualify for tax-free withdrawals. Can money be withdrawn w/o penalty for relocating to another state? Can money be withdrawn for financial difficulty if the penalty is paid? If so, is the penalty 10%? If an employee resigns from the company, can he withdraw all monies without a penalty? Does this prohibit him from joining a 401K at a later date? If you are under 59 1/2 you will pay 10% plus the regular tax bracket you are in. If you leave a company you can reinvest it in another IRA, Like a stock market account with any investment company or CD within 90 days without any penalty. Just ask for a “for the benfit of yourself transufer” to the another finical instatution. Any bank can help you set up an account and do the paper work. This will hold it in a IRA account until you deside what you want to do with the money. Can I take some out tax or penalty free if I replace it within 60 days? What to a 401k upon death of owner? If am still working full time do I still have to make 3% withdraw from my 401k,if so can I put it in to 401e acct. would that satisfy the regulation of 70.5 years old.